This is another of this week’s paintings of the Sleepy Hollow lighthouse on the Hudson River. I don’t know if I’ll ever get enough of this subject; these have been so much fun to paint! 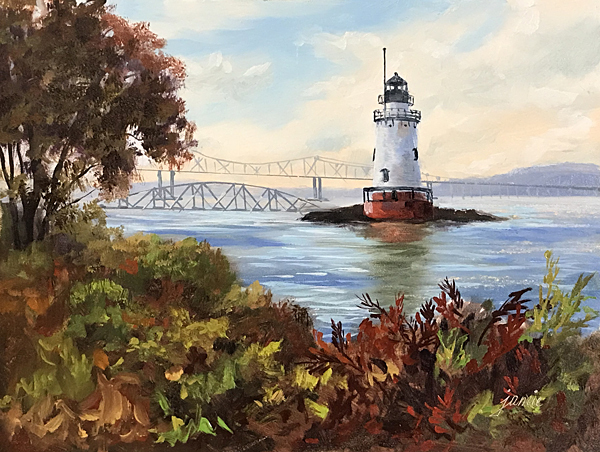 I’ve been wanting to do more paintings of the Sleepy Hollow Lighthouse (aka Tarrytown Lighthouse) for years, and finally got around to doing some this week. I spent two days exploring six or seven of the parks along the Hudson River around Tarrytown and Sleepy Hollow to find some new vantage points and check out old ones. Now I have so many ideas for paintings that my head is spinning! This 6×8″ painting features the lighthouse, and also shows the Tappan Zee Bridge in the background, as well as the little bridge over to the lighthouse from the shore. One thing I found out in this week’s research is that the lighthouse was originally about a half mile off shore. The shoreline was filled in for various developments, and now it’s just a footbridge away! There’s a ton of construction going on in the area now, as those old commercial developments have mostly been torn down to make way for new luxury high rise condominiums. The good news is that in the process, several gorgeous waterfront “Riverwalks” have sprung up, thanks in no small part to Scenic Hudson. Although the population density is increasing dramatically, so are the accessible views. 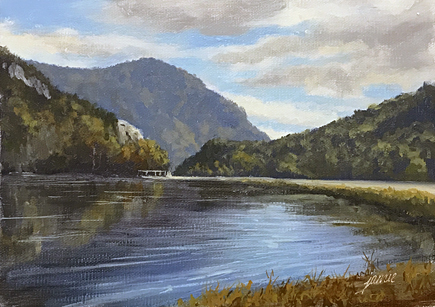 I had a wonderful autumn day last week painting with friends along the Hudson River. We went to Boscobel Restoration in Garrison NY, where there is a long bluff overlooking Constitution Marsh and the river. The marsh was just starting to take on that reddish autumn glow, and an enormous sailing yacht went by, providing a great focal point out in the river. This is always one of my favorite vistas to paint — especially as the marsh turns to warm colors in spring and fall. 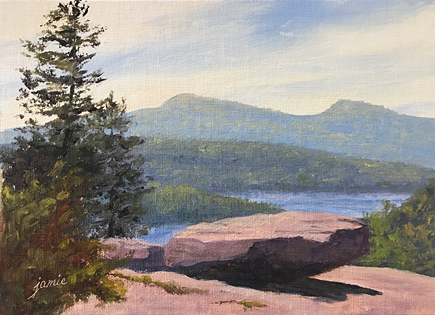 This view of Crawford Notch, New Hampshire, was painted by many of the Hudson River School artists, who traveled up to the White Mountains to take in the spectacular scenery. Saco Lake lies just north of the notch, reflecting the mountain and amplifying the drama of the setting. The white rock on the left side of the notch is called Elephant Head. You can hike up there for majestic views in all directions. When I’m able to do a larger painting of the scene, you’ll be able to see why it’s called Elephant Head! Paintings are underway of views from up there too. Painting is in a sealed polybag, with custom ivory, archival mat and backing board to fit into any standard 8×10″ frame. 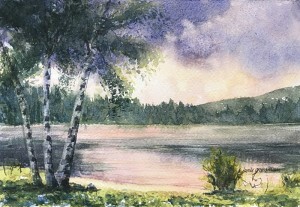 Painting is just under 4×6″ and matted to the 8×10″ size. Framing is available at a small extra cost, but I have had these mats and backing boards custom cut so that you can use a standard frame of your choosing and it should fit perfectly! This summer, my husband and I went to the John Burroughs Nature Sanctuary, aka Slabsides, to walk around the pond, see his cabin, and take photos. It was not easy to find the place, but once we finally got there, we enjoyed walking the property and seeing why he had 7,000 visitors during his time at the cabin! The pond is quite beautiful, with striking rock outcroppings and a rocky peninsula to explore. The original cabin is still standing too. I did this little painting from one of the many photos I took there. Painting is in a sealed polybag, matted, with backing board. The painting is about 7 1/2 x 11″, and is in a custom, ivory, archival 12×16″ mat with archival backing, so it will fit in any standard 12×16″ frame. 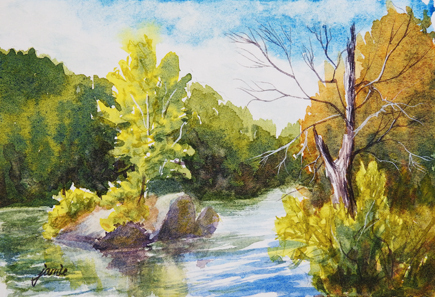 Fall is just beginning here, but I still have a bunch of my summer paintings to post! 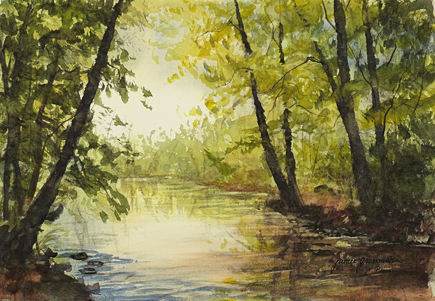 If you’ve been tagging along on my blog, you’ve probably noticed that I’ve loved doing these watercolor creek paintings this year. Some have focused on reflections, some on foliage like overhanging tree limbs and branches, and this one is all about the light streaming through from the back of the painting and hitting the water. I’m going to really miss these warm summer days, standing along the stream banks with my easel. I think I’ll have to frame a few of these and hang them in my house to remind me of what it felt like!